Originally posted: April 22, 2017 . Last modified: June 2, 2018 . Our grown-up bacon grilled cheese sandwich takes your old fashioned grilled cheese and dresses it up with bacon, brie, muenster, and mozzarella cheeses. April is National Grilled Cheese month, and while we are late to the party, we showed up with style. For today’s dish, we decided to take your traditional grilled cheese sandwich and dress it up a little. Kim and I wanted to prepare a sandwich that was both nostalgic and mature. We spent the whole week trying to decide how we were going to accomplish that goal. We started by removing the American cheese and using a blend of deli cheeses in its place. While I love the flavor and texture of that oil-based stand-by, I wanted to use cheese that was rich and dense. Munster is a mild cheese, but it has such a refined buttery taste. Additionally, it melts well and stretches beautifully. The mozzarella we used was from our local deli and is also mild cheese. Brie was the last cheese we selected for its smokiness and its texture. Adding the bacon was a last minute decision that paid off. It was cooked in the oven so it would crisp nicely. The bacon pulled everything together. Also, the crunchy texture contrasted well against the smooth and creamy cheeses. This bacon grilled cheese sandwich is miles ahead of its humble beginnings and is a wonderful indulgence for any adult looking for a more refined grilled cheese offering. It is my hope you will enjoy this recipe as much as we did. In closing, let me wish a long life, love everlasting, and tummy full of delicious cheese! Making this grilled cheese is simple and doesn’t take long to prepare. First, cook six pieces of bacon per the package instructions and set them aside. The oven is an excellent way to cook bacon because it keeps the bacon extra crispy and clean up is a breeze. All the process takes is aluminum foil, a sheet pan, some non-stick spray, and a cooling rack. If you are interested in how to cook bacon this way, send me an email, and I will go through the process. Getting back to the recipe, once the bacon is cooked, set it aside then slice your brie and mozzarella. After the cheese is sliced, don’t be afraid to squish it flat between your fingers. It will help flatten the cheese making it thinner, thus allowing it to melt faster when cooking. Next, melt your butter in your microwave in a microwave-safe bowl. I usually put it on low power for a minute or two minutes to melt the butter. Afterward, preheat your skillet over medium heat. While the pan warms, take a basting brush and slather the butter on the outsides of each piece of bread. Now you can start building the sandwich. Start with bread, butter side down, then place one slice of Muenster, then add three pieces of bacon. At that point, place the mozzarella and brie on top of the bacon. Lastly, top everything off with the other slice of bread, butter side up this time. The pan should be hot enough now. So, using a spatula, place the sandwich into the skillet. Let it cook for about four to six minutes on each side. Go ahead and push the sandwich down with your spatula as it cooks, so the cheese seals the bread slices together. If you are worried the cheese isn’t melting well, then cover the skillet with a lid, and the cheese will steam a little. Once everything is nice and browned on each side, remove the sandwich from the pan. Place it on a cutting board and slice it in half if you want. If not, put it on a plate and dig in! You can serve it with chips and salsa, soup, or whatever you desire. All that matters is that you enjoy the meal. This recipe makes two grown-up bacon grilled cheese sandwiches. Need any ideas for a scrumptious side dish? Then check out this French Onion Soup or this Broccoli Cheese Soup! If you like this bacon grilled cheese recipe, please leave us a comment and rate the recipe card. You can also find us on Facebook, Pinterest, Twitter and Instagram searching for Berly’s Kitchen! Our grown up bacon grilled cheese sandwich takes your old fashioned grilled cheese and dresses it up with bacon, brie, muenster, and mozzarella cheeses. First, cook the bacon per the package instructions. Next, slice the mozzarella and brie. Once sliced, go ahead and flatten the cheeses out some, so they melt evenly. Afterward, melt the butter in your microwave. While the butter melts, preheat your skillet on medium heat. After that brush the outsides of each slice of bread with melted butter. Then build the grilled cheese sandwich as follows: bread, butter side down, then muenster cheese, bacon, mozzarella, and brie cheeses. Then top with a slice of bread, butter side up. Cook the sandwich in the preheated pan for approximately four to six minutes on each side. Lastly, remove the cooked sandwich from the skillet and serve it while it is still hot and gooey. The recipe makes two sandwiches at 388 calories per grilled cheese. They can be served with soups, chips, or anything else you desire. 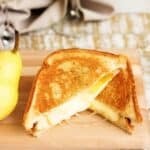 Apparently I need to give grilled cheese a second shot, I’ve always despised it but now I keep seeing these delicious recipes! I love your cheese choices and how simple you kept the grilled cheese. Saving for later, after 20 years, I’m giving it a chance! Talk about one heck of an epic grilled cheese! I’m sure the bacon adds a great savory crunch and that bread looks DIVINE! I think I prefer that over a reuben sandwich. The bacon is a great touch! This sounds like something my husband would LOVE! 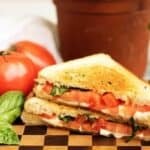 I always spice up his grilled cheese a little more than mine with more “stuff.” This will definitely be a recipe that I try next time I make tomato soup! The brie sounds like the best part! This looks delicious! Will have to give it a try! This looks incredible and I only read the title to my husband and he wants to try it! Wow this looks great! I loved grilled cheese sandwiches. My husband would go crazy over this recipe! Love the presentation, thanks for sharing! Thank you, Tasia! Bacon and cheese, they always work well together 🙂 Thanks again for commenting and have a great day! That looks so good, bacon and cheese, perfect combo. Thank you for commenting! How can you go wrong with those two ingredients, right? lol! Now that is my kind of grilled cheese. Thanks for sharing! Yes please! Seriously making this the next time it cools off. My word! Grilled cheese has always been my fave, dunking it in soup is my best. Definitely given me an idea on what to make for dinner one night this week, before April ends! Thank you, Meg! Mine too, and if you dunk this sandwich, it will still have the crunch of bacon with all that soup-soaked bread 🙂 I hope you love it when you make it! I love that you paired this with tomato soup!! Going to be trying this grilled cheese soon! What a fabulous mix of cheese. It sounds wonderful. Thank you, Elise! I am glad you like it. Have a great day! This is my all time favorite comfort food and the one I forget to make the most! Delish! You’re speaking my love language right now. Nothing screams comfort food more than a grilled cheese! Thanks for sharing. So much yummy!! I love grilled cheese and this is SUCH a great type! …especially with a tomato soup! Thank you, Brit! Me too, I love grilled cheese 🙂 Kim always makes soup when I make grilled cheese, such a wonderful combination. Thanks again for commenting and have a wonderful day! Ugh my favorite. Beautiful pictures! I would love to try this with some turkey bacon! What’s not to love about this recipe? All of my favorite things in one sandwich! Making this tomorrow for sure! This looks incredible. I am definitely going to try this one. I love a great grilled cheese sandwich with bacon! Thanks for the recipe. This sounds delicious to me! My husband, however, is not a brie fan….booooooo. Do you think that smoked gouda would be a reasonable substitute? Can’t wait to try it! OMG this looks amazing! I love the name of it too “grown up” haha! Brie is my fav! I don’t know where the idea that grilled cheese is a kid’s food. Maybe because it is so easy to make and hard to really mess up? For us, we have a grilled cheese meal probably once every two weeks and we always look forward to it. I make my own sweet sourdough bread loaves and coordinate grilled cheese night around the day I make the bread. Add in some freshly made tomato soup and O… M… G. Simple, but so luxurious. Thanks for commenting, Ben! Sounds like you make a delicious grilled cheese.